Arabia Mountain National Heritage Area officials, DeKalb County commissioners and other key partners unveiled renderings of the signage that will mark trailheads and other areas of historic and natural interests in the National Heritage Area. 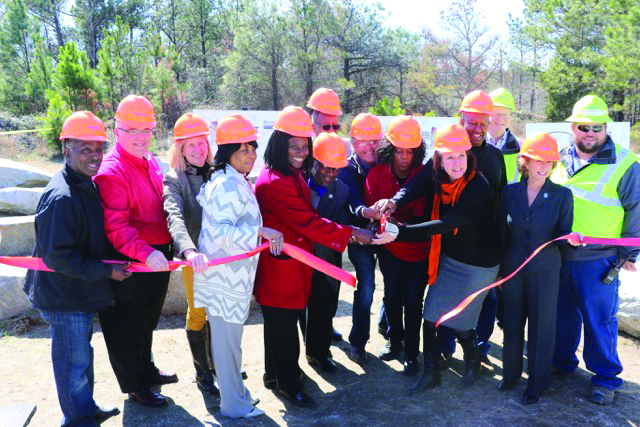 The unveiling followed another big announcement on the same day: the DeKalb County Department of Recreation, Parks and Cultural Affairs’ launch of the South River Kyak Access Point at 4460 Panola Road, Lithonia. Once that project is completed, a path will provide access to the edge of the South River Water Trail for non-motorized watercraft. Mera Cardenas, executive director of the Arabia Mountain Heritage Area Alliance, expressed excitement over the South River Water project as she announced the March 16 Arabia signage program. She said the comprehensive program would be constructed in phases for the “world class” attraction, which sits in far Southeast DeKalb. “This sign project will allow us to build gateways to welcome visitors to DeKalb County and the National Heritage area at sites like Vaughters Farm, the city of Lithonia and Flat Rock Archives,” said Cardenas, adding that trail users will no longer have to wonder how far they have to go when they enter the trail. She said every trailhead will have a kiosk and a map. Roadway signage, Cardenas said, will help people unfamiliar with the area identify the sites of interest that have historic and natural interests. 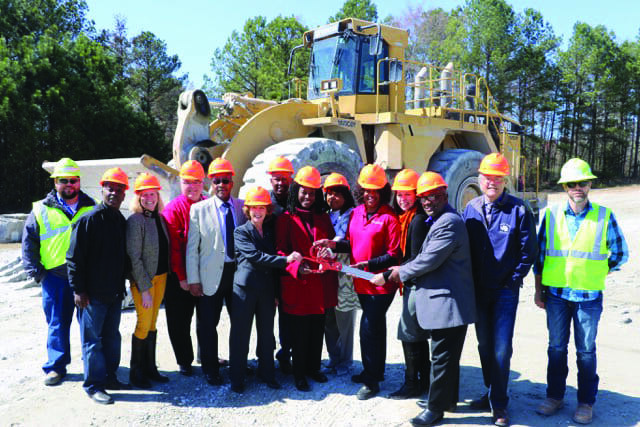 DeKalb County Commissioners Mereda Davis Johnson and Gregory Adams, helped unveil the concept drawings and the granite stones donated by the Lithonia Quarry for the signage project. Johnson, who represents District 5 where the National Heritage Area is located, was recognized for introducing a resolution to secure approximately $563,000 in funding for the project. The money will come from the county’s hotel/motel tax. Johnson said her husband, Congressman Hank Johnson, who was on DeKalb County’s Board of Commissioners in 2001, allocated parks bond funding for Arabia. “I’m very happy to be here today. I wish Hank could be here to see what his seed has produced,” said Mereda Johnson, adding that the hotel taxes will fund stage 1 and a portion of stage 2 of the total amount requested for the signage project. “This is a prize jewel and it needed to be treated as such. We have to have the best possible signage ever to sell this mountain (bring in tourists),” said Johnson. Earlier in the day, Johnson also praised the launch of the South River Kyak project, saying it would be the first among several projects the county’s parks department has planned to promote the underused natural resource that is the South River. Cardenas said having a National Heritage Area in a community has a significant economic impact on communities, according to a 2012 report from the U.S. Department of Interior. “This is similar to having a manufacturing plant or a hospital in a community,” Cardenas said. The Alliance commissioned the design concepts for the comprehensive signage program with Signature Design. Each site, ranging from the Arabia Mountain PATH trailheads to gateways such as the Vaughters Farm, Flat Rock Archives and the city of Lithonia, will have signs designed and produced to assist visitors. Hanson Aggregates Southeast designed the first phases of the Arabia Mountain PATH and is donating stone for the gateway structures and entrance signs. Hanson also will provide specialized equipment and personnel to assist with the construction. The Arabia Mountain National Heritage Area includes portions of DeKalb, Rockdale and Henry counties with nearly 18 miles of paved hike/bike trails. Arabia is one of only 49 areas across the country recognized as “National Heritage Area.” The Arabia Alliance is supported by a network of public jurisdictions and private partners. Partners collaborating on the signage project include DeKalb County, City of Lithonia, Discover DeKalb, Stonecrest Business Alliance and Hanson Aggregates Southeast, which donated a portion of the granite materials.